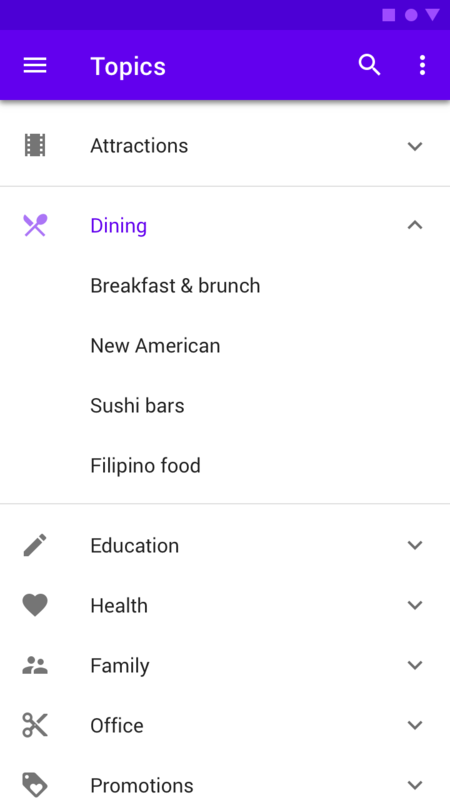 Material Design's indicates that lists can be expanded and collapsed with a down/up arrow. I need such a list with additional actions on each rows. "Dining" is expanded here. I want to allow the user to configure the "Dining" category (add Dining items, change Dining preferences, etc.). "Sushi bars" is visible. I want to allow the user to configure its "Sushi bar" preferences. Browse other questions tagged menu material-design contextual-menu or ask your own question. How to handle expandable menu in breadcrumbs?